The bodies of at least 33 people, some children, have been recovered after a crowded boat capsized in the Niger River in north-western Nigeria. Emergency officials say they managed to rescue 84 people on board, but another 30 of the total 150 passengers remained unaccounted for. They blamed the accident on overloading of the boat, which had been travelling from neighbouring Niger. Nigeria has seen many boats capsize due to poorly maintained overcrowded boats. 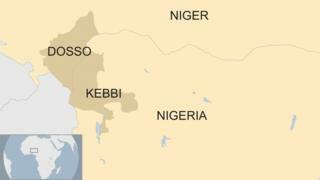 The accident happened on Wednesday morning in the remote area of Lolo village, in Nigeria's Kebbi state, but details only first started emerging on Friday. The boat had been carrying traders across the border from Gaya, in the Dosso region of Niger. They were planning to attend a village market in Nigeria. A co-ordinator for Nigeria's National Emergency Management (NEMA), Suleiman Mohammed Karim, told AFP news agency that the boat had a capacity of 70 passengers but survivors said 150 people plus their goods were on board. Referring to the remaining missing, he said: "Having spent two days on the water, we presume they are all dead."